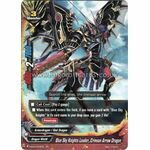 When this card enters the field, if you have a card with "Blue Sky Knights" in its card name in your drop zone, you gain 2 life! The boy knows of the faults of the fleeting world. That is why he protects and saves it. [Call Cost] [Put a monster from your field into the drop zone & Pay 3 gauge]. When this card enters the field, you gain 4 life!! The beast that supports the Sky Temple. Crush the world right now! Standing there, there are things that I have seen for the first time. You may only call this card if you have four or more different <<Duel Dragon>> in the drop zone. "Storm of Thunder" When this card enters the field, destroy all defense 2000 or less monsters on your opponent's field! [Call Cost] [Pay 3 gauge & Put this card on top of a <<Duel Dragon>> monster on your field]. When your opponent's card attacks, change the target of that attack to this monster. [Counter] [Act] When your opponent attacks with a <<Weapon>>, you may discard one card from your hand. If you do, destroy that <<Weapon>>. 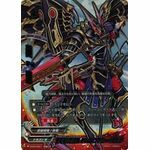 When this card enters the field, destroy all monsters on left and right of your opponent's field. Before playing with danger, train up your body! If this is the only card attacking, this card's attack cannot be nullified by a card with "Dragon Shield" in its card name. A shotel. A special weapon that can slip through an opponent's shield for an attack.